Hewlett Packard's gaming behemoth the Blackbird 002 is finally available in the UK, although you will have to visit Harrods to get your hands on the £3,200 PC. Built with the Voodoo branding, the HP Blackbird 002 has been available over the pond for some time, but unless you wanted to ship one over yourself then you were stuck. Not now, however, because if you wander into the London Harrods store you can now pick yourself up a 002. Inside the case (no monitor with this baby – and to do it justice you probably won't be settling for a 14" CRT) you'll find some pretty awesome looking compartmentalisation that allows the PSU to sit at the foot of the case. 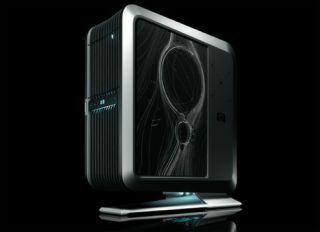 Water cooling, 4 gigs of RAM, an Intel Core 2 Quad Q9450 processor and dual ATI Radeon HD3870, a 500GB storage drive and dual SATA 160GB HDD as well, not to mention one of the most impressive cases around, make this one hot PC (or not, thanks to the water). "HP Blackbird 02 isn't just a new PC – it's an entirely new performance platform created by gamers for gamers, which means it delivers the kind of experience that will make a believer out of even the most hard-core enthusiast," said Rahul Sood – CTO at HP's gaming unit. Now, how much are kidneys going for these days?